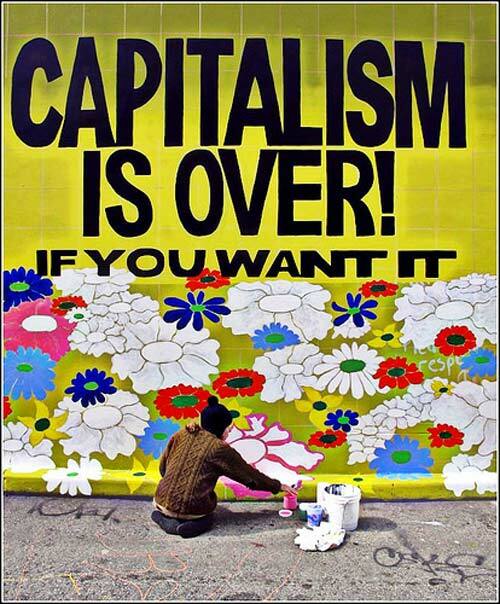 Capitalism as now constituted has proven to be destructive for the vast majority of beings on the planet and the planet itself. The failure of the capitalist system has required vast inputs of public money, non-renewable resources, and human labor to keep it functioning and benefiting less than 1% of the global population. Ignored in the fragile and oppressive capitalist scheme are the poor, the indigenous, and those most deeply affected by environmental degradation worldwide. While human kind throughout history has engaged in trade, it is the co-option of trade into the capitalist military industrial system supported by U.S. and international taxpayers that we reject. The anti-globalization movement continues to lead the charge in resisting free trade agreements and treaties that defeat local health and safety regulations, decimate jobs, and cause environmental damage. We support these efforts to reign in global corporations that seek to benefit from harmful trade agreements. Capitalism now counts wealth in terms of Gross Domestic Product, or GDP. In this accounting, waging war and making and selling armaments add to the GDP, while growing and preparing our own healthful food at home and spending time reading with children does not. The more the U.S. military destroys lives and infrastructure overseas, the more our U.S. GDP rises through military expenditures and the costs of reconstruction and foreign aid. To add immeasurably to the problem, the U.S. military is the largest single consumer of fossil fuel in the world, making it the most important entity responsible for climate destabilization. And given the way that GDP is calculated, wars and money spent to remediate climate devastation add substantially to the U.S. GDP, whereas conservation of energy, which adds to our real common wealth, does not. The kingdom of Bhutan measures its success in GNH – Gross National Happiness rather than GDP. GNH is derived from wellness indicators for economic, environmental, physical, mental, workplace, social, and political well-being. We believe this is a healthier and more accurate measure of success.